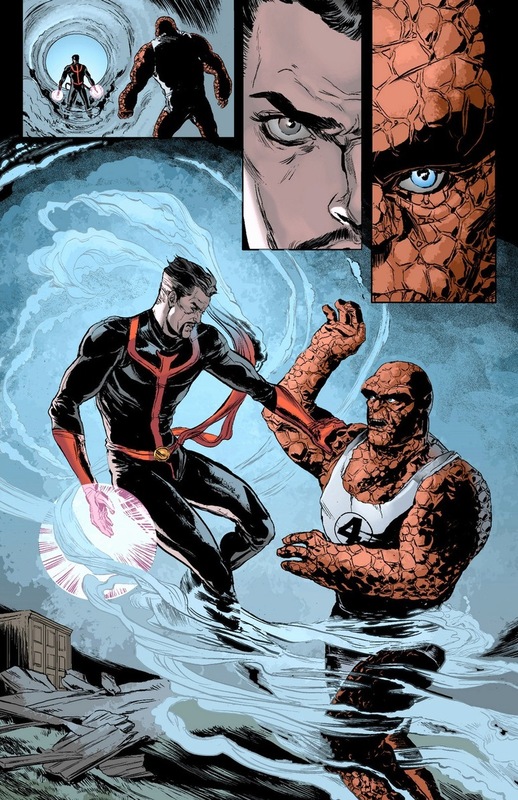 As we left off on Wednesday, Doctor Strange figured out that the spirit of deceased Brother Voodoo’s brother has been possessing and using superheroes to get back at the good doctor. 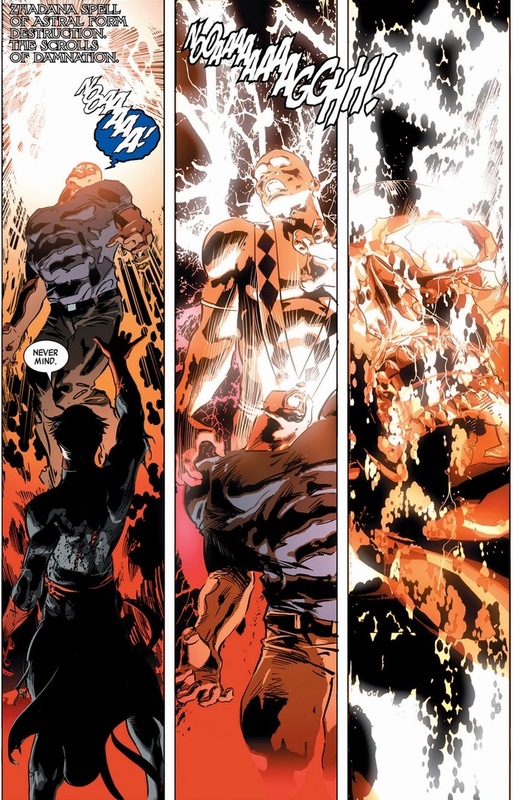 Plus, he took down sorcerers Daimon Hellstorm and Jennifer Kale as well. 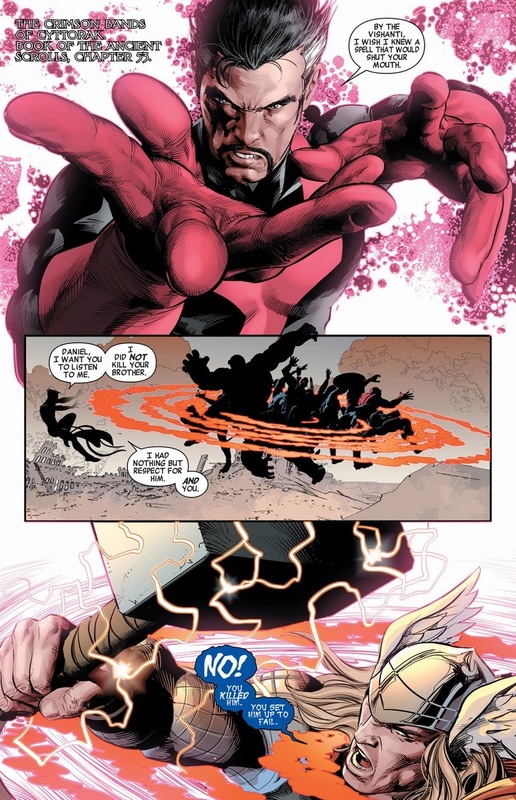 Well, what’s worse than having a vengeful spirit possessing a whole set of Avengers? That’s right. Two sets of Avengers. Unfortunately, being superheroes involves far more reaction than prevention. Mainly because the crime makes the stories interesting. 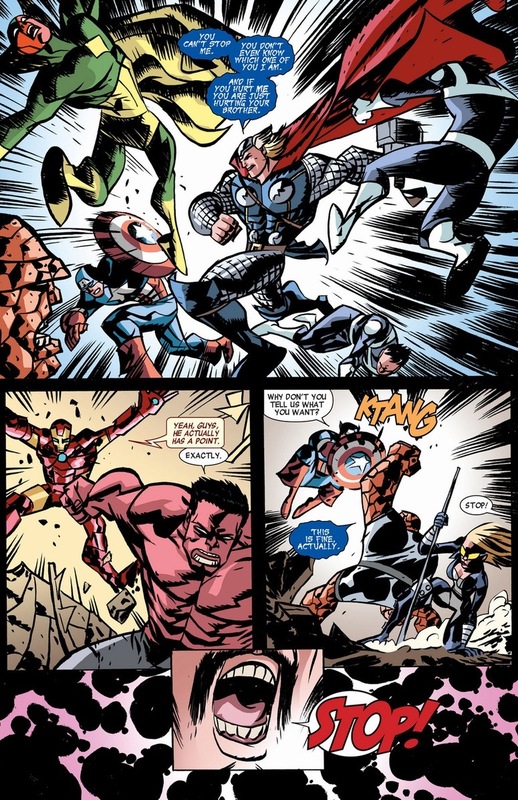 But when you get a bunch of superpowered dudes (and dudettes) together and, say, a possessed Thor smashes them across the Avengers Mansion lawn — there’s not going to be a lot of discussion going on. 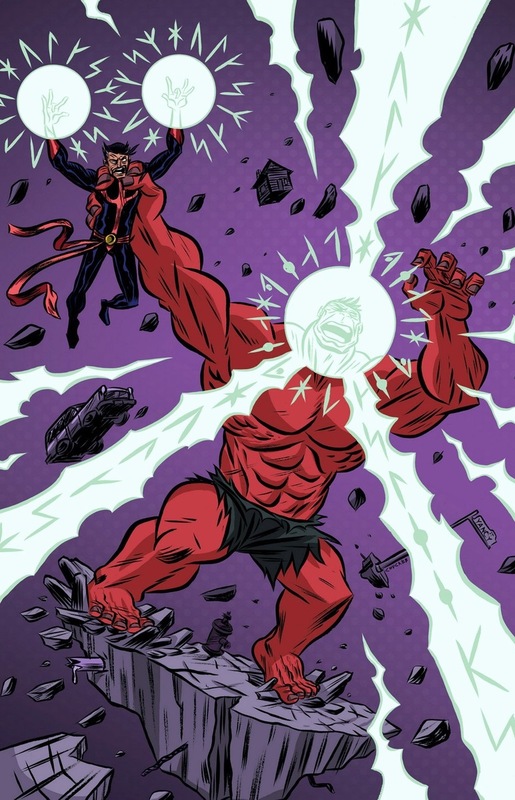 Having super strength means you’re going to use it, you know? Doctor Strange has some backbone. Besides his gift for lengthy monologues, he’ll always take the impossible challenges to prevent further bloodshed and mayhem. Like pinch hitting demonic baseball games. That’s the obligation of superheroes. 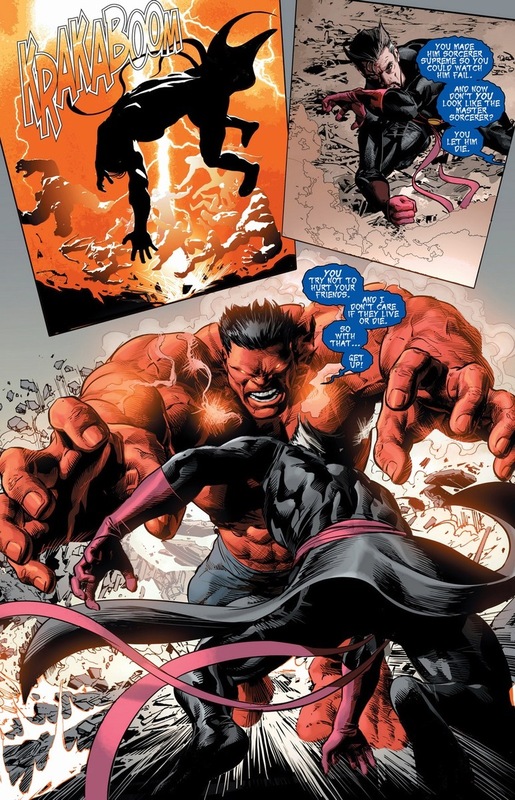 While he may not be as strong as he once was as Sorcerer Supreme, he’s still no slouch. 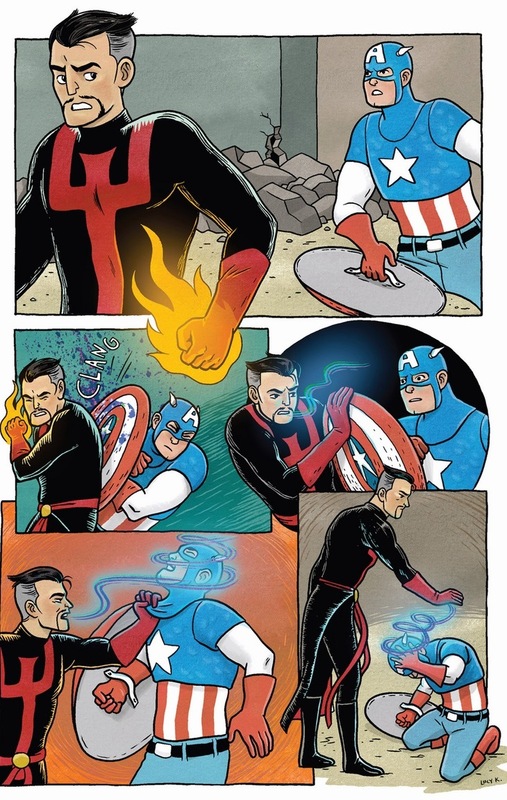 As the final issue of the New Avengers commences, we learn Daniel Drumm doesn’t play fair mainly because that’s the first rule of being a supervillain. Even a ghost supervillain. 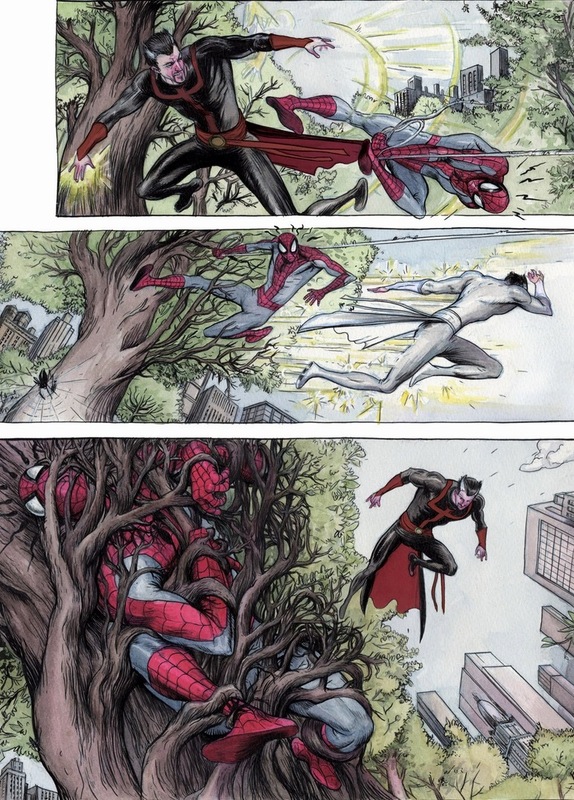 The next pages consist of gorgeous double-page spreads that I don’t want to break up. Click the pictures for a larger version and see the machismo and threats flow. 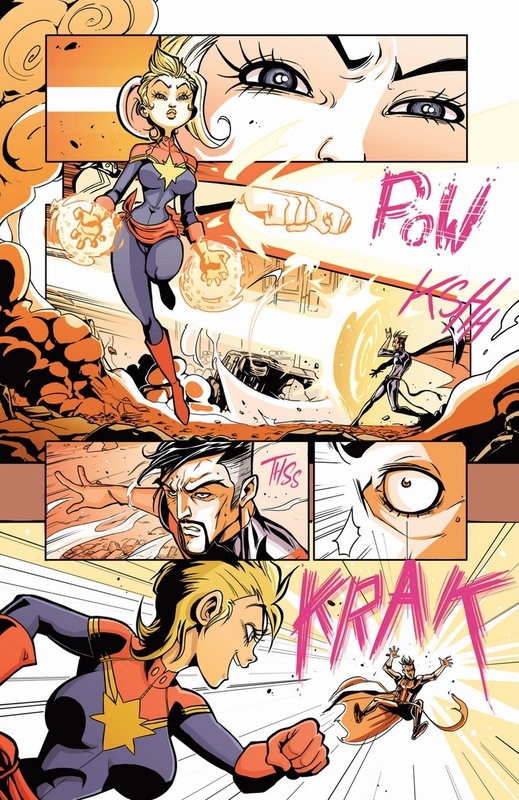 Now, the next eight pages, which I’ll show you uninterrupted by my commentary, are each drawn by a different artist. I’ll put their names afterwards. 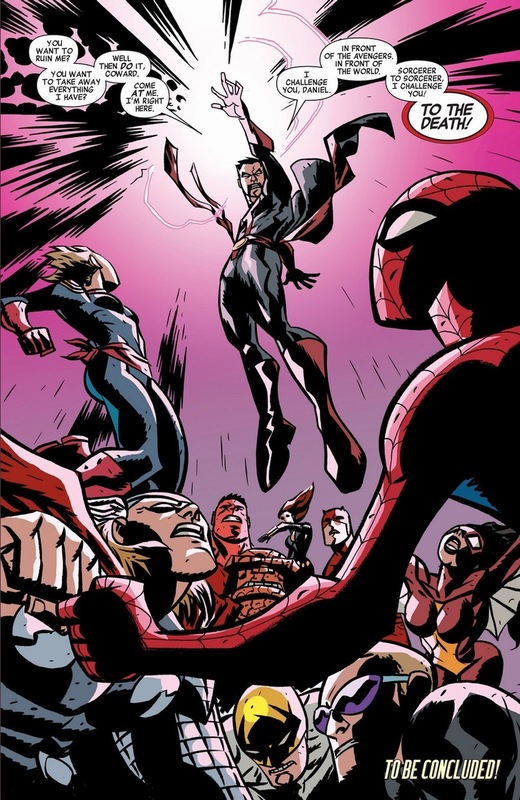 For those who wish to complain about the insane idea that Doctor Strange couldn’t possibly fight all of them at once, I say too bad. 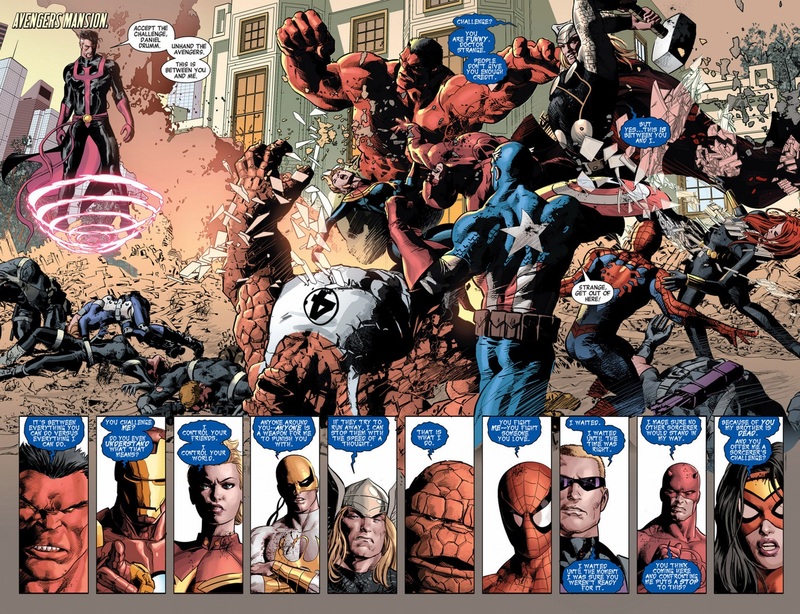 Brian Michael Bendis wrote the Avengers for eight years and over 200 issues. If he wants to end his run in a badass fourteen-on-one fight, I say let him. Plus, it’s an awesome idea. 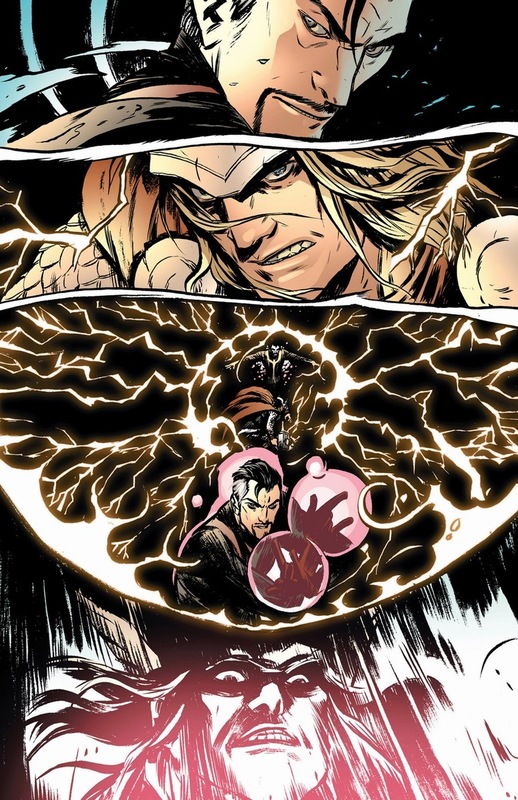 Okay, so Doctor Strange loses, but fantastic effort on his part. 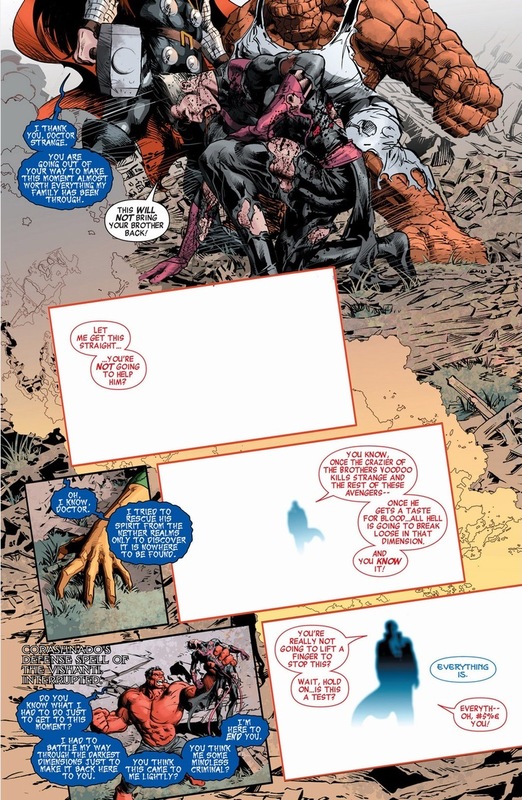 And to give credit, the pages were drawn by Chuck BB, Yves Bigerel, Becky Cloonan, Farel Dalrymple, Ming Doyle, Lucy Knisley and the issue’s main artist Mike Deodato. Still, even beaten and defeated, our magician has one more trick up his sleeve — and it’s not a pigeon. I’m skipping a few more pages of battles. 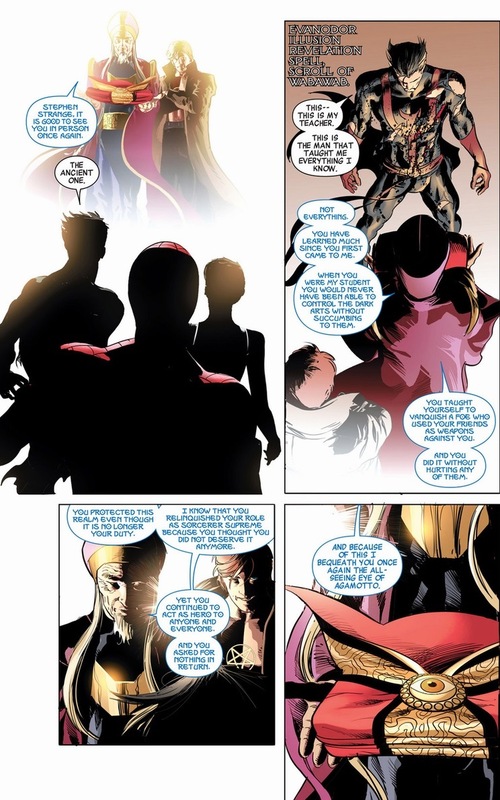 Vision and Luke Cage have their proud moments before Doctor Strange has to clean up this mess himself. After all, I guess Daniel Drumm is in the doctor’s rogue gallery now. 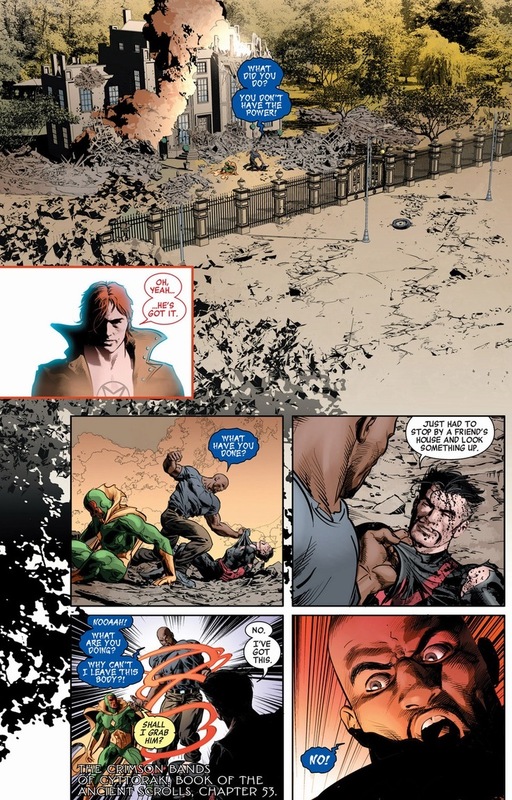 And why is Daimon Hellstorm watching the fight (who can’t be killed being the son of Satan and all)? Like the disembodied voices said, magic’s a test. How exciting. 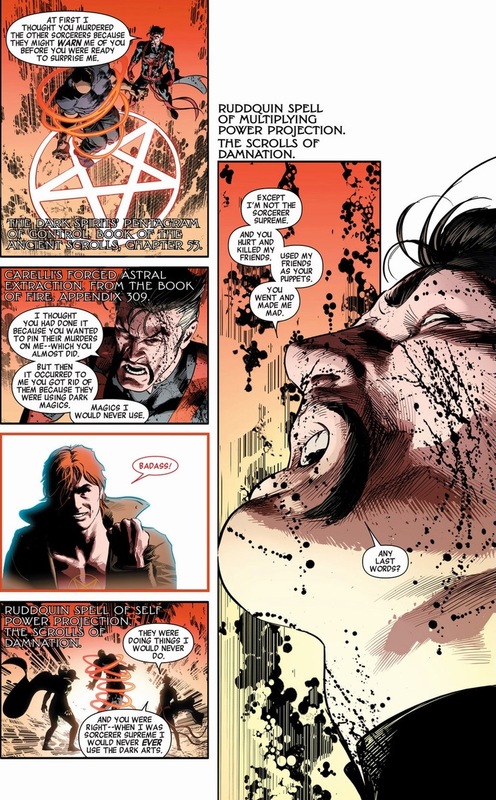 I know I probably should have covered his relinquishing of the Sorcerer Supreme title before I covered how he got it back, but that’ll be on Monday. 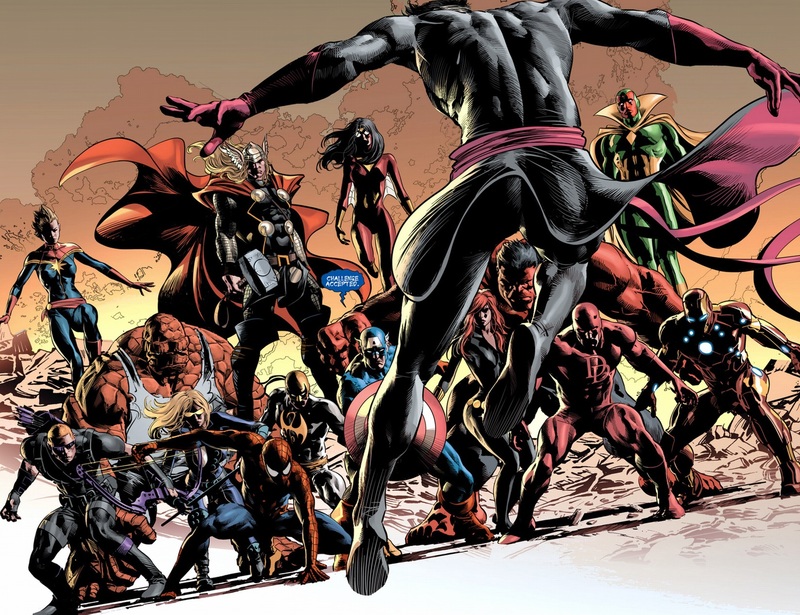 We’ll read Doctor Strange’s adventures one more time, as we go back to World War Hulk through Secret Invasion. Yes, it’ll end on a sad note, but after today at least you already know the happy ending. That looks like a good story. Okay, great write-up. 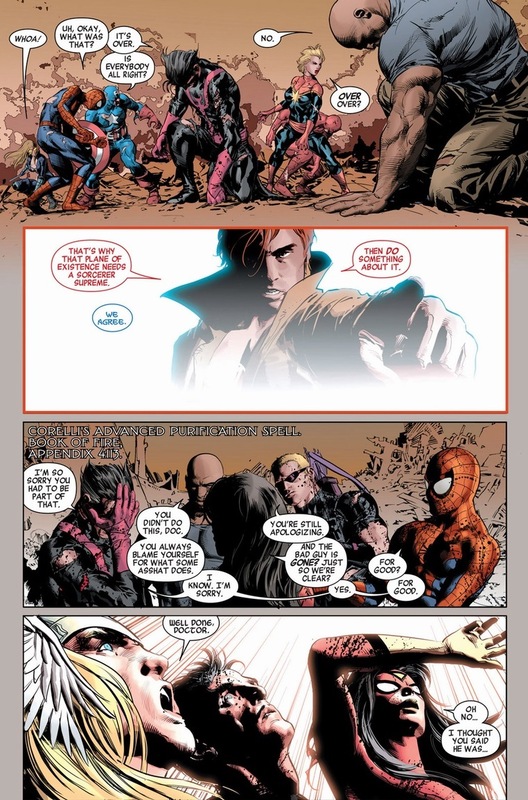 And this time around, Bendis’ dialogue seemed much stronger. 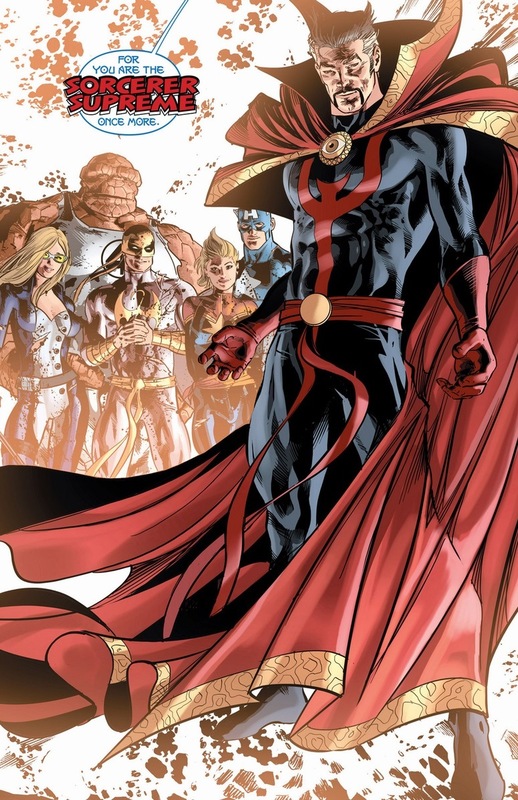 Anyway, in the near future I’m planning to do one or more blog posts covering a previous time when Doctor Strange lost the title of Sorcerer Supreme, during the run written by David Quinn in the mid-1990s. I’d like to read that when you write it! 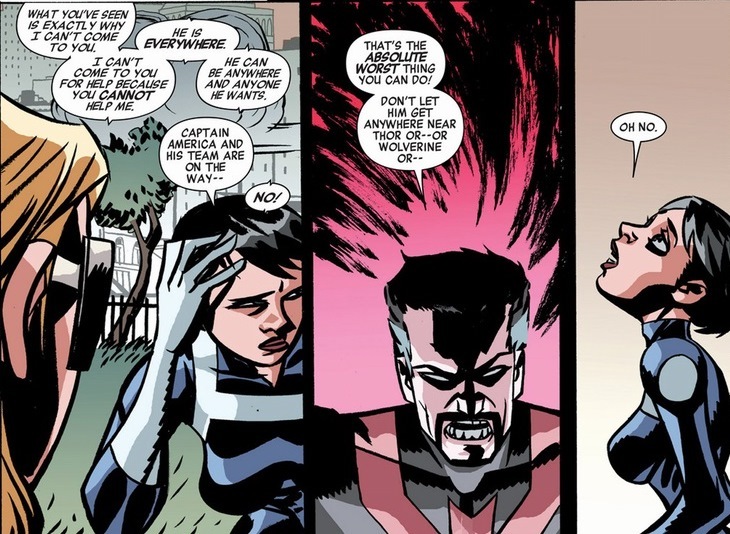 I concentrate far too much on the past fifteen years or so of comics that I know I’m missing out on some great stuff. Like you and your knowledge of those fantastic artists you profile. Here’s the first part. There was soooo much plot and background to David Quinn’s first several issues to explain that this installment really ran long. Hopefully I’ll be more succinct in the other two parts. In any case, I hope you enjoy it. The second and third parts of the David Quinn retrospective are now up on my blog, as well. Hope you enjoy them!